The United States has launched its war on Iraq with strikes on Baghdad which targeted President Saddam Hussein and other senior Iraqi officials. US officials say Iraq has responded by firing four missiles into northern Kuwait - a claim that has been denied by Baghdad. But, according to American and British officials, Patriot missiles intercepted two Scud-type missiles over Kuwait. Shortly after the first explosions in Baghdad, US President George Bush delivered a live television address announcing the start of war. US officials have described the attacks as an attempt to "decapitate" Saddam Hussein's government by killing senior figures. It is not clear whether the targets were hit by the Tomahawk cruise missiles and precision-guided bombs which rocked Baghdad at 0534 local time (0234 GMT). Iraq's information ministry said one civilian had been killed and several others injured in the US strikes. It said some non-military targets had been hit, including a customs office and a site belonging to Iraqi radio and television. 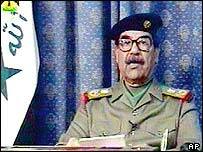 Shortly before the sirens sounded the all-clear at 0600 GMT, Iraqi TV broadcast what it said was a live speech by Saddam Hussein. 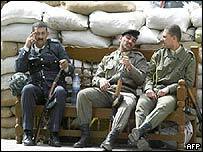 The Iraqi said the "invaders" would be defeated, and called on the Iraqi people to defend their country. Saddam Hussein is known to have a number of body doubles, but correspondents familiar with the Iraqi leader say they believe it to have been him. BBC defence correspondent Jonathan Marcus says the attack on Baghdad was on a much smaller scale than had been expected for the opening of the conflict. But UK Defence Secretary Geoff Hoon said the first attacks were only "preliminary operations". There was a "clear timetable" for the start of a full scale offensive and British troops were "ready to go", he added. British and US troops in northern Kuwait were put on full alert following reports that Iraqi missiles were being fired into the area. Soldiers immediately donned full protective gear, including gas masks. There are no reports of casualties. Officials say they are examining debris from the missiles. BBC News Online's world affairs correspondent Paul Reynolds says that, if any were confirmed to be Scuds, this would be proof that Iraq had broken the terms of the UN resolution which bans Iraq from having missiles with a range beyond 150km. Shockwaves from the explosions are reported to have been felt in Kuwait City, where sirens sent people scurrying for gas masks. Subsequent reports say the missiles carried conventional, not chemical, warheads. UN chief weapons inspector Hans Blix alleges in a BBC interview that Washington was never really interested in giving inspections a chance. President Bush gave his order for the first strikes on Baghdad after being told by the CIA that it believed it knew the whereabouts of Saddam Hussein, the Washington Post reports. CIA chief George Tenet is said to have believed the Iraqi leader was holding consultations with advisers in a southern suburb of Baghdad. US officials said 2000-pound (900-kilogram) satellite-guided bombs were dropped on the city by F-117 Nighthawk stealth fighter-bombers. Six US Navy vessels - including two submarines - fired more than 40 Tomahawk cruise missiles on the capital from their positions in the Mediterranean, the Red Sea and the Persian Gulf. Reports said anti-aircraft guns were in action for about 15 minutes, after which the city became quiet again. Black smoke was seen south of Baghdad after the US strikes. Hours after the first attacks, most of the capital's shops remain shuttered and closed, but street traders are out selling fruit and tea, reports the BBC's Paul Wood from Baghdad. Mr Bush addressed the American nation about two hours after the passing of the 0100 deadline he had set Saddam Hussein to go into exile or face war. The US president promised a "broad and concerted campaign" and said the US would prevail. But, he warned, the campaign could be "longer and more difficult than some predict". 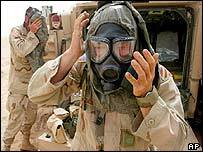 About 150,000 US and UK troops have taken up battle positions for an imminent invasion of Iraq. "You can expect further operations very shortly," the UK defence minister said on Thursday morning. "This wasn't the massive assault everyone predicted. That is yet to come"
"This morning's [Scud] attacks were a reminder of the dangers here"